Catalogue accompanying Indeed, a Sheila Hicks exhibition curated by Camille Morineau for Foundation De 11 Lijnen. The title “Indeed” expresses insistence: the exhibition underlines the importance of the work of this artist who, since the late 1950’s has redefined the practice of using fiber and weaving in the field of design as much as in that of visual arts. “In deed” is also a legal term used to express conformity: the exhibition is the artist’s reaction to the particular context of the Foundation, its landscape, its history, its architecture. “Indeed” is the result of a coincidence. The use of linen in Hicks’ work echoes the historical linen culture tradition of Flanders. The fortuitous return of this material to its original cultivation site is emphasized by the interest shown by the artist for the essence of this material. 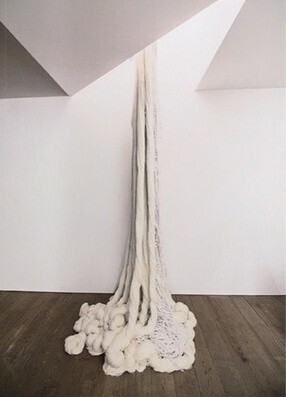 Thus, some of the works’ titles resonate with the different steps of harvesting and spinning of linen.